Animals in cages have no freedom and is worth a better life. Outside of the parliament of Oslo, on Wednesday afternoon, lots of Noah activists demonstrated against the animals’ rights in the world we live in. And the animals’ defence is: The cage deprives the animals to move, experience and explore their surroundings and have natural social relationships with other animals. Knowing how these animals live in the wild, it is understood that the cage itself is the biggest load for them – regardless of how clean or large the cage is. NOAH has worked in more than 20 years to protect the animals. 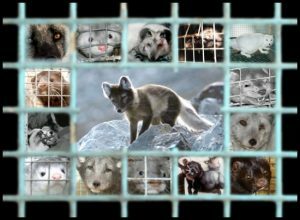 Today the majority of the Norwegian population agrees that the fur industry must be stopped. More and more companies follow this opinion too. And Distrita, of course. “We see that animals want to live, and believe that they should not therefore be killed. We see that animals want to develop, and believe that they therefore need freedom. We see that animals seek out happiness, and believe that they therefore need to be allowed to live and develop in accordance with their nature. Animals do not exist for human use. They exist to live their own lives. This is why NOAH works against all exploitation of animals.